Metso has signed a sponsorship agreement with WWF Finland and the John Nurminen Foundation to support the WWF’s Saimaa ringed seal conservation work and on the John Nurminen Foundation’s projects intended to improve the state of the Baltic Sea. “Metso’s industrial presence in Finland extends far back, and with the country celebrating 100 years of independence, it seemed only natural to select Finnish targets to sponsor,” explains Metso’s Head of Sustainability, Kaisa Jungman. “The sponsorship targets we selected are both inherently Finnish and, simultaneously, topical globally. 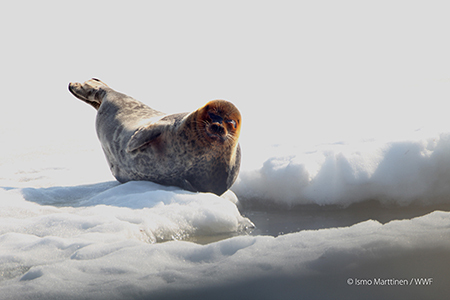 The Saimaa ringed seal is a critically endangered species which can be found only in Finland. The species’ future is threatened by climate change, among other things, which impacts various parts of the globe in different ways. Similarly, the work carried out by the John Nurminen Foundation to improve the condition of the Baltic Sea is also significant on a broader scale. Clean water is a critical factor for the future of mankind and all living things,” continues Kaisa Jungman. “The Saimaa ringed seal is one of the world’s rarest seals. Following decades of active conservation work, the Saimaa ringed seal population has been preserved and increased in the Saimaa lake system, but the species continues to be critically endangered and will require protection for a long time to come. Consisting currently of around 360 individuals, the population is severely threatened by climate change. Snow and ice are vital for the seals as their pups are born in caves burrowed inside snowdrifts. If the Saimaa ringed seal disappears from Finland, it will disappear from the entire planet. It is a matter of honor for us Finns to save it from extinction. WWF Finland is involved in a conservation research by the University of Eastern Finland which is studying how artificial snowdrifts piled up by humans could assist the ringed seals during winters with little snow. The man-made snowdrifts have been created successfully over several winters and, this year, WWF’s volunteers have also been involved in piling them up in Saimaa. We are thrilled that Metso is participating in the protection of the Saimaa ringed seal by supporting our work,” says WWF Finland’s CEO Liisa Rohweder. “Our shared goal is a clean Baltic Sea. We are delighted that Metso decided to support the concrete and effective protection of the Baltic because, in order to save it, comprehensive cooperation is needed throughout the Baltic region. The Foundation’s Clean Baltic Sea projects have achieved a reduction in the phosphorous load in the Gulf of Finland by about 75 percent over the past decade, which is already visible as a clearing up of the gulf’s waters, particularly in its eastern part. In addition to water treatment plant projects, we are looking into reducing biogas production emissions throughout the Baltic Sea’s catchment area, the ongoing gypsum treatment of farmlands and encouraging sustainable fishing methods through our Local Fishing project. We also closely monitor new methods for the removal of the nutrients that have already entered the Baltic Sea,” explains John Nurminen Foundation’s Secretary General, Annamari Arrakoski-Engardt.